Brian P. Hamachek | I write code. I build things. Unfortunately, there is no official Facebook SDK for Windows Phone and it seems unlikely one will be released anytime soon. As a result, Windows Phone developers have resorted to displaying the Facebook mobile web login page within a WebBrowser control in their apps. This approach works, but due to the fact that the WebBrowser control keeps the browser cookies isolated to that particular app, it requires any new user of your app to always login to Facebook. This significantly reduces the effectiveness of using Facebook login to expedite your app’s account creation process. 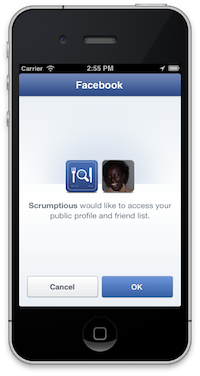 If the user already was logged into Facebook from their phone’s web browser, they will by-pass the login screen and be taken directly to the screen for authorizing your app’s permissions, just as on iPhone or Android. As the login request’s redirect_uri I pass the address to a resource on my web server. This server-side page processes the result of the login request and exchanges the login code for an access token using Facebook’s server-side authentication flow. The code required to perform this is quite lengthy and outside the scope of this blog post. It has been extensively documented in Facebook’s API documentation though. If the user has never logged into Facebook using their phone’s web browser, they will still need to login, but the flow will still function. Only works with Windows Phone 8 and higher due to requirement for custom protocol. Requires a lot of work to set everything up properly. Unless you expect to have a LOT of users it probably isn’t worth the effort. You can see this functionality for yourself by downloading the WNM Live app. I added this approach to the WNM Live app a few months ago and it has been working reliably.